It's another Bank Holiday weekend, and...it's sunny again! We've been so lucky with the weather recently, we've had so many beautiful spring days. I swear it's leaving everyone in a better mood than usual. 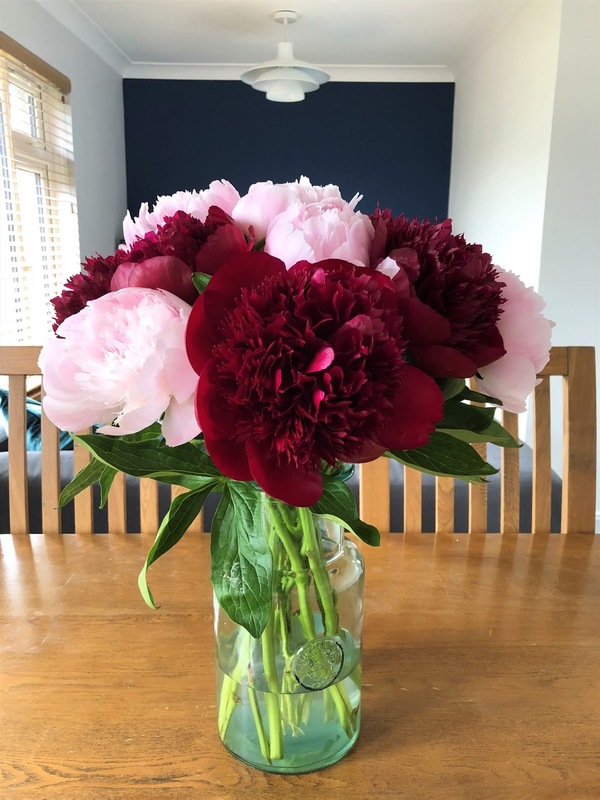 Our house is currently full of peonies, and I am living for it! I didn't manage to get any last year, so I'm making the most of them while they're here. Paul bought me the most beautiful, huge bouquet of them last weekend. It has the palest of pink and some almost burgundy flowers. I'm doing my best to keep them around, as they're now starting to fade, and I'm find more and more petals on the table everyday. There's another little bunch in the living room that are yet to open, a very sweet gift from my grandmas, as she knows how much I love them. 1. Ice coffee! We've been keeping sweetened espresso (decaf for Paul) made up in the fridge for instant iced lattes or americano's. It' the best treat on a hot afternoon. 2. The smell of BBQ's everywhere you go. 3. Finding new breakfast spots in my favourite city (Edinburgh, in case you were wondering). 4. Coconut and passion fruit ice-cream from Mary's Milk Bar. 5. Watching our little carrot babies get bigger by the day. I'm not too involved with the whole gardening thing, so I'm not sure when they'll be big enough to eat, but I look forward to trying them. 6. The way songs can instantly transport you back to a certain time or place, remind you of a certain person, or bring back a certain memory. 7. Trying to get a paw print from Sookie for my mum. She's a wriggly little thing and basically refuses to do it. Resulting is messy feet prints all over the floor. 8. Booking tickets to see the Lion King while we're all in New York...I'm so excited!! Ahh The Lion King is going to be so good! I haven't been but it's so high up on my list!